Are You Ready For The Opportunity Of A Lifetime? Msit No’Kmaq is an Indigenous youth leadership development and skills building experience and a partnership between Indigenous leadership and communities, organizations, government, international sailing organizations and the private sector along with 45 Indigenous young people from across Canada. Indigenous young people between the ages of 16 – 24 recruited from across Canada, with a focus from Atlantic Canada, will apply to participate demonstrating why this experience is the right fit for them! 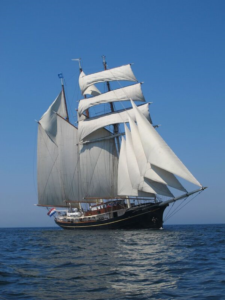 The selected 45 youth will become Sail Trainees aboard the Gulden Leeuw, a Dutch flagged Tall Ship with extensive experience with youth and young sailor training. 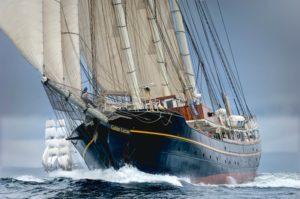 The Sail Trainees will arrive in Halifax, Nova Scotia for July 29th, 2017 for Rendez-Vous 2017 Tall Ships Regatta, where many Tall Ships will be sailing Canadian waters to honour the 150th anniversary of the Canadian Confederation. Each day on the Ship the Sail Trainees will be responsible for the running of the ship, under the training of the Professional Crew of the Gulden Leeuw. From watch keeping to cleaning the deck, navigating and learning the ins and outs of sailing the Trainees will also take part in a daily leadership program. The Gulden Leeuw Sail Training complemented by the leadership component will ensure young people leave the experience with new skills, understanding of themselves as leaders and a deeper world view. After working as part of the crew of the Gulden Leeuw, you will arrive in Le Havre, France approximately 21 – 24 days later. After spending a few days (to be determined) in Le Havre, Trainees will return to their home communities. Connecting culture, content and capacity building for Indigenous young people participants will learn, share and build a community with other Indigenous young people at sea while racing across the Atlantic. Develop leadership skills in Indigenous young people. Provide a meaningful and experiential skills building opportunity for Indigenous young people. Connect Indigenous youth from across Canada where they can share and celebrate their cultures, life experiences and ideas while building a lifelong community. Increase awareness about the strength and capacity of Indigenous young people via the story telling that will come from the experience and the voyage. All participants will receive a stipend for participating and must be planning to return to school in the fall of 2017. This isn’t only a youth development program - it is an experience that will provide you skills that you will carry with you for life. Each Sail Trainee will receive a stipend for participating. This will be approximately $1700, half of which will be provided upon landing in France and the remainder upon the submission of a final evaluation in mid September. 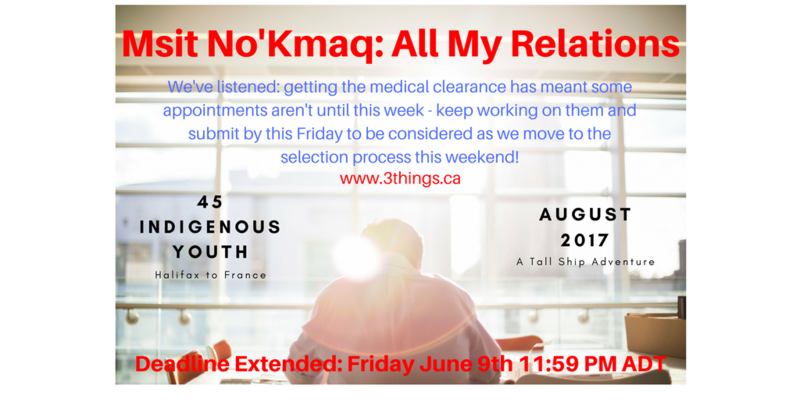 We are grateful to one of our partners, The Mi’kmaw Native Friendship Society, (MNFS) who are managing this component of the project. They have been providing supports to urban Indigenous People in Halifax since they first opened their doors in 1973. They were the lead on an important community project, This Is What I Wished You Knew that brought together 50 Aboriginal community artists; youth, adults and Elders in Halifax, to explore their individual and collective identities and develop stories they “wish you the public knew”. You can learn more about the MNFS and the Centre at http://www.mymnfc.com/ and be sure to visit http://www.thisiswhatiwishyouknew.com/index.html to hear the powerful messages shared in the mural project. Upon selection participants will receive paperwork that is required to be completed and returned prior to the project starting so the MNFC can process your stipend. A reminder, that to be eligible for this project you must be a planning to return to school in the fall of 2017 and have a Social Insurance Number (to process the stipend). Each Sail Trainee is required to pay a registration fee of $1,500.00. This covers all related travel (from your closest major airport to Halifax and return from France to your initiating airport. ), ground transportation in Halifax and France, meals and programming. We are encouraging First Nation, Metis and Inuit governments, community organizations, institutions (like schools) and others to both sponsor young people to participate and support them in this process. Download our official letter to help secure sponsorship from your community here. When you apply for this project, you must have a commitment of funding or self-fund the registration fee. These fees must be paid upon acceptance of the program. Walking the Red Road is an intentional way of living within the teachings of our Elders and Ancestors that includes a life of courage, humility, respect, love, and spiritual connection. There is never someone on this road walking a perfect path, but many who are traveling with guided direction, self-reflection and in a good way. It is important to recognize the difference between walking the Red Road and being on the Red Road. If you are connected to ceremony, have strong ties to your culture, tradition and language you could say, truthfully, that you are on the Red Road. Though for those who are Walking the Red Road it is a much bigger commitment to yourself, your family, community and culture. It is finding balance and incorporating teachings on ‘how to be’ during ceremony or in specific situations and translating that ‘how to be’ in the rest of your life. How you interact with others, care for yourself, care for the Earth and the gifts it provides and how you live your life day to day, especially when no one is watching, that is the difference between being on the Red Road and walking the Red Road. As you travel at sea, with 44 other young people, facilitators and the professional crew it is critical that you are open and willing to be on the Red Road and work toward walking the Red Road in your role as a Trainee. Click here to read the agreement that all those selected will be required to sign onto when selected. Click Here to learn more about the Ship and the overall experience!